The traditional 2D drawings are generally employed to convey PMI, such as dimensions, tolerances, bill of materials (BOM), notes, surface finishes, weld symbols, and coordinate systems. However, as 3D design becomes more and more prevalent, the issues with 2D drawings become more and more apparent. 1) Expensive and time-consuming to create and maintain. According to the Office of the Secretary of Defense in U.S. and commercial companies in various industries, around one third of engineering dollars are spent in creating and maintaining 2D drawings. Even worse, around 60% of 2D drawings don’t match their 3D designs, which have led to massive downstream production failures and waste. 2) Hard to understand and easy to misinterpret. 2D drawings are a retreat from the intuitive 3D space. 2D drawings require the projection from 3D to 2D for full detailing, creation and maintenance and then require the mental reconstruction from 2D to 3D during their interpretation. The unnecessary complexity leads to misinterpretation and operational errors. Model-based processes solve these critical problems by communicating PMI directly in 3D and avoiding the time-consuming 2D drawings process. Companies piloting this initiative have witnessed up to 50% reduction in development costs, especially in the areas of rework, scrap, and tooling and fabrication costs. Driven by the substantial benefits inherent to MBD, the U.S. Department of Defense published the latest Military-Standard-31000 Revision A to fully define the requirements of model-based deliverables for its entire supply chain in 2013. In the commercial space, General Electric (GE), American Science and Engineering (AS&E), and other companies are adopting MBD aggressively as well. GE Measurement and Control group targeted 20% of their production to be conducted directly from 3D models to fabrication by 2014 and 30% cycle time cut in the near future, thanks to their MBD initiative. 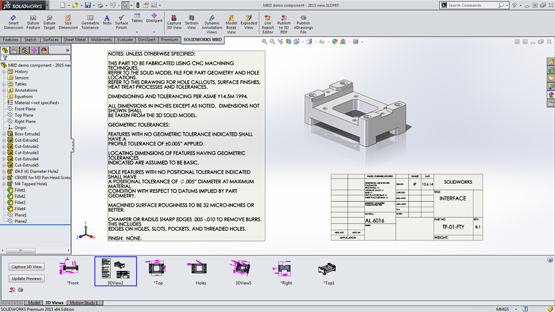 MBD is an add-on to any of your SOLIDWORKS Standard, Professional or Premium licenses. What do you think about MBD? Comment below! Check out our Model-Based Definition Video & Resource Library for other related content.